GV529 .L86 2007 (Recreation. Leisure—Physical education and training—Gymnastics. Gymnastics exercises—Heavy exercises—Jumping exercises.) Guest appearance by Ly! GV498 .L86 2007 (Recreation. Leisure—Physical education and training—Gymnastics. Gymnastics exercises—Calisthenics. Group exercises—Rope jumping or skipping.) Guest appearance by Chandra! GV1061.8.P75 L86 2007 (Recreation. Leisure—Sports—Track and field athletics—Foot racing. Running—Other special topics, A-Z—Psychological aspects.) Guest appearance by my sister-in-law, Claire. GV1061.8.P75 L86 2007a (Recreation. Leisure—Sports—Track and field athletics—Foot racing. Running—Other special topics, A-Z—Psychological aspects.) Same deal, pretty much. Guest here is my brother Daniel. RC553.M36 L86 2008 (Internal medicine—Neurosciences. Biological psychiatry. Neuropsychiatry—Psychiatry—Specific pathological states, A-Z—Masochism). Daniel again. He actually owns a ton of shirts with stripes on the front, in case you were curious. Or maybe he owns only one shirt like that and I just have some weird belief about his wardrobe. That could also be true. GV1065.17.T73 L86 2008 (Recreation. Leisure—Sports—Track and field athletics—Foot racing. Running—Distance running—Marathon running—Special topics, A-Z—Training). 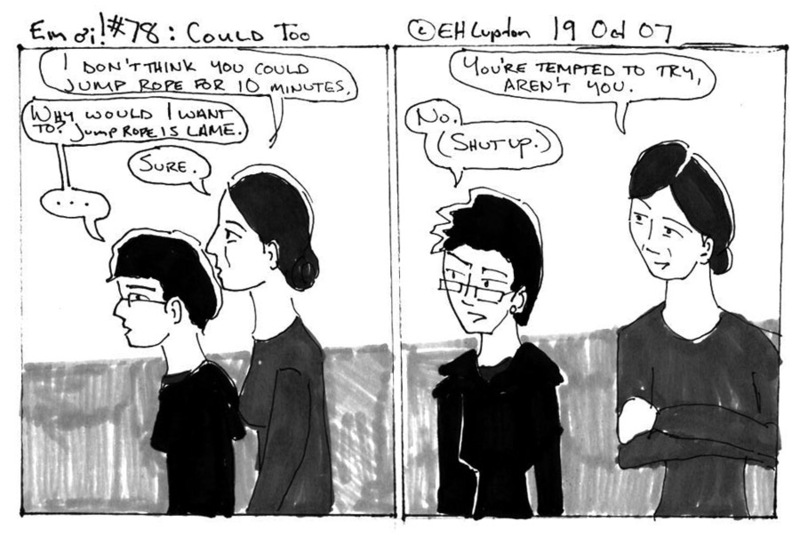 I think that when I drew this, I was actually training for my first half marathon. I remember telling B when we met that my memoir will eventually be called I Wish I Were Eating Curry Right Now. It’s a recurring theme in my life. GV1062.5.M3 L86 2008 (Recreation. Leisure—Sports—Track and field athletics—Foot racing. Running—Distance running—Individual races, events, etc., A-Z). Here, M3 is the Cutter number for the half marathon at the Madison Marathon. HD9993.S952 L86 2008 (Industries. Land use. Labor—Special industries and trades—Recreational equipment. Sporting goods—Special products, A-Z—Swimming pools—General works. History.) The pool in question is at the Princeton Club West. In case you were curious. Now I mostly swim at the local Gold’s, which has solid lane lines. I miss the Roschach-like tiles on the previous one. A ton of people have come up to me in the last two weeks to tell me they want to start running. Even my mom is getting in on it. (Hi, Mom!) 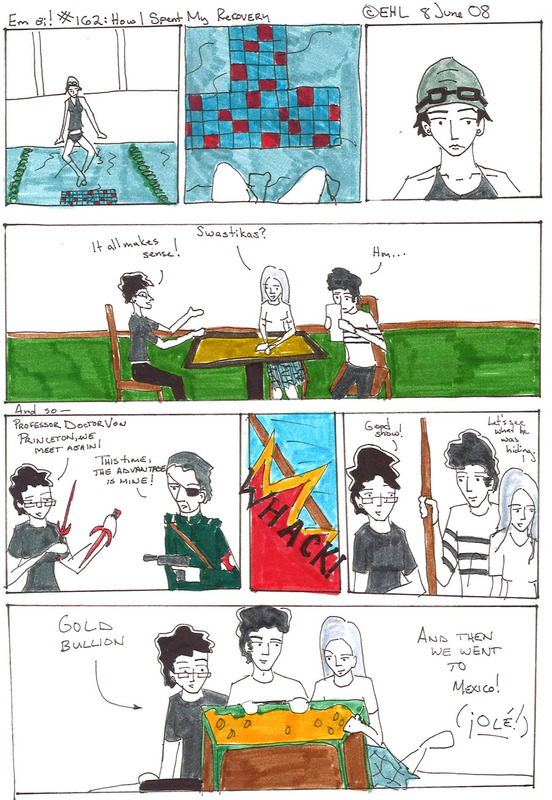 So to celebrate, here are some of the comics I’ve drawn about running. 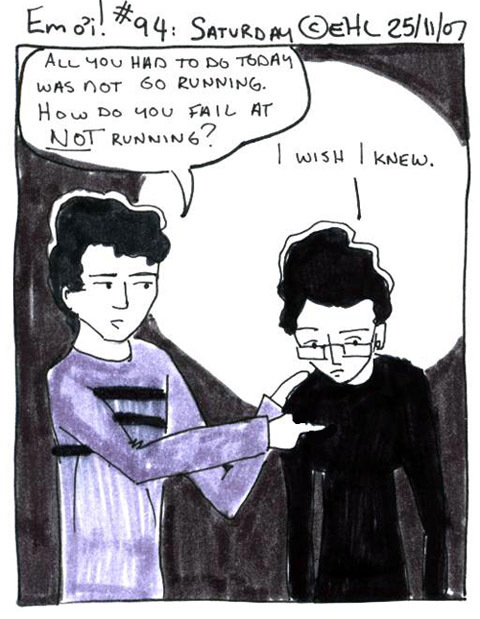 Not all of them, even–I have drawn a lot of comics about running I guess. Anyway, I am not feeling especially funny this week and I need to take some time off. I’ll be back next week with new stuff.